The past few months of frenetic diplomacy on the Korean Peninsula, including a highly symbolic summit between the two Korean leaders in April, have represented a remarkable turnaround from the brinkmanship of last year. In fact, at times it has almost seemed too good to be true. Last week, perhaps to be expected, North Korea delivered a jolting reality check by suspending high-level inter-Korean talks and threatening to pull out of the summit with the U.S. scheduled for June 12, which has left the Trump administration – and seasoned Korea watchers – scrambling to decipher Pyongyang’s intentions. While taking aim with its displeasure at ongoing military exercises between South Korea and the U.S., more importantly the statement delivered last week via KCNA by North Korea’s vice-foreign minister and former top nuclear negotiator, sets out Pyongyang’s stall for the upcoming summit from what it wants to project as a position of strength – that is, as a nuclear power. In so doing, it is a warning to the Trump administration to temper its expectations and demands, especially those of the new national security advisor John Bolton, who has publicly mooted removing all North Korea’s nuclear materials to Tennessee à la Libya, while not easing pressure and sanctions until this has been achieved – a position seen in Pyongyang as tantamount to unilateral capitulation. The statement is thus a clear reminder that Kim does not subscribe to the CVID (complete, verifiable, irreversible) model of denuclearization touted by Washington. Pyongyang instead envisages a process of “action for action” in which measures for denuclearization are traded for benefits including lifting of sanctions, normalization of relations, and security assurances – although the precise scope of the latter remain undefined by Pyongyang, and both Seoul and Washington have drawn a line on the removal of U.S. forces from the peninsula. But even if such a process and sequencing of reciprocal measures can be agreed to – indeed there might not be much choice – there are huge question marks whether complete denuclearization is in the minds of the North Korean leadership. While no-one can fully know North Korea’s intentions and motivations, one certainty is that its negotiating strategy will be to get as much as possible in return for giving away as little as possible. Pyongyang has already announced a freeze on its nuclear and missile tests. It is in the process of shuttering its nuclear testing site close to the border with China. It seems likely too that it will offer up its ICBM program as a key bargaining chip that it sees as having brought the U.S. to the negotiation table. It may even agree to capping its production of fissile material for bombs and allowing inspections. However, it is highly unlikely, at least not according to the swift timeframe envisaged by the U.S., to go as far as irreversible dismantlement and disarming, especially if it perceives it has gotten little substantive in return. Furthermore, no peace treaty or any amount of security assurances can, if its previous statements are to be believed, replace the physical security provided by nuclear weapons, despite the high economic and diplomatic costs to keeping such. North Korea is thus perhaps hoping to kick complete denuclearization into the long grass while, over time, de facto normalizing some minimum level of nuclear deterrent. China and Russia too, may be willing to live with a nuclear-armed North Korea that has ceased its testing and development, reasoning that by now there is not much choice. Kim might be gambling that Trump wants a deal and that even if it falls short of immediate CVID, it can nonetheless be presented as a stepping stone to a nuclear-free North Korea. As Trump’s track record suggests, appearance is often more important than reality. Any semblance of a deal may conveniently leave many of the complex details fudged for subsequent negotiations. 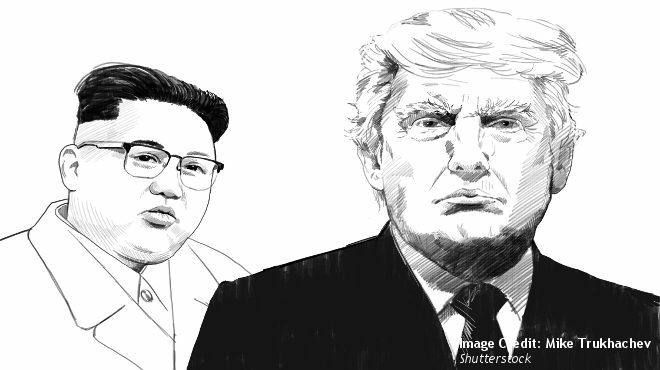 The recent statement by North Korea can, therefore, be seen as an attempt to remind Trump to focus on doing diplomacy his way and go for an achievable deal, and not to take heed of those around him advocating a stance of “CVID or bust.” Flattered by assertions that he personally had coerced Pyongyang to come to the table, even Trump must by now be realizing that he faces a formidable negotiation partner. The summit is now in doubt but is still likely to go ahead even if delayed. Both sides have much to gain from it. However, it remains highly uncertain if there will be a bridging of the gulf in perceptions and expectations that currently exists between the two sides. South Korean President Moon Jae-in, who was in Washington yesterday to meet with Trump, has played an instrumental role as a mediator so far, though he still has his work cut out in narrowing the gap. Alec Forss is a project coordinator at ISDP’s Stockholm Korea Center. The views expressed here are his own and do not necessarily reflect those of the Center.